St. Peter’s Health Partners (SPHP) is launching a new brand campaign on Friday, August 5, highlighting the care offered by SPHP and the team of dedicated people that provides that care. This campaign focuses on the service lines of cardiac, cancer, and orthopedics, as well as the programs and services offered by Continuing Care, and St. Peter’s Health Partners Medical Associates. The start of this new campaign coincides with SPHP’s sponsorship of local media coverage of the 2016 Summer Olympics in Rio de Janeiro, Brazil (Aug. 5 – 21). The campaign will feature television spots, print ads, digital (online) advertising, outdoor (billboards), and social media. On the first day of the campaign, August 5, the ads will run on WNYT NewsChannel 13 at the following approximate times: 9:58 a.m., 10:48 a.m., 11:06 a.m., 12:24 p.m., 4:58 p.m., 6:05 p.m., 6:44 p.m., 8:14 p.m., 9:22 p.m., 10:29 p.m., 11:36 p.m., 11:58 p.m., 12:44 a.m., 2:26 a.m. The theme of this campaign is “Behind Every Patient, There Is A Team.” The campaign highlights REAL SPHP patients as well as our staff from throughout SPHP. The spots were taped at key landmarks and locations including downtown Albany, Troy’s riverfront, Crossgates Mall, the Beverwyck in Slingerlands, St. Peter’s Medical Campus in Clifton Park, and The Crossings of Colonie. 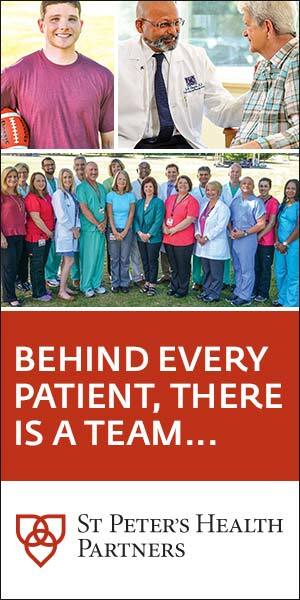 The campaign features facilities, technology, and more than 150 physicians, nurses and staff from SPHP facilities. We thank each of them for volunteering to participate in this effort. The campaign was produced by SPHP Corporate Communications with our partners Media Logic, Working Pictures and Gary Gold Photography. To view samples of the new advertising that is part of the campaign, go to www.SPHP.com/team. Please feel free to share this information and the links with family, friends, and members of the community who may be interested.